Click here for updated and simpler instructions on how to switch your iPhone from AT&T to Straight Talk (2015). I’ve been an unhappy AT&T customer for years and I have decided it is time for me to leave. Paying more than $200 a month for a two iPhone family plan with limited minutes is just ridiculous. Gladly, there are now other options. I’ll be saving 50% or more on my cell phone bill so I’ll definitely give Straight Talk a chance and see what they have to offer. I can always leave if it does not work out, but whatever happens, I will not do business with AT&T again. I’ll be porting my number and requesting AT&T to unlock my iPhone 4S (the same instructions apply for the iPhone 6, iPhone 5, iPhone 5s, iPhone 5c or iPhone 3GS, read below for more details). I’m not a computer programmer or hacker, so if I can get this thing working, I’m sure you’ll be able to do it as well. I will be updating this post during the following months to report on Straight Talk’s iPhone service, so make sure to check back every now and then to ask questions or post feedback. You can call Straight Talk directly or go to their website. There is no need for a physical card as long as you have a credit card to pay for the service. Straight Talk Service Review: I’ve been on Straight Talk since October 2013 and so far my experience has been great. By switching I was able reduce my cell phone bill by 50% and I haven’t noticed any difference in my service. I will never return to ATT! UPDATE: After updating to iOS 7.0.3, I’m glad to report both data and MMS are working as they should. This means that with the carrier update provided with iOS 7.0.3, switching your AT&T iPhone to Straight Talk should be a lot simpler than it was before. After activation, insert the SIM and you should be ready to go! Read steps 1 & 3 for instructions. Step 4 “updating data settings” is no longer needed and you can ignore it. Here are the steps I’ve taken to switch from AT&T to Straight Talk. This is a guideline of what you’ll have to do. If you are thinking about switching or are in the process of doing so, I’m sure you’ll find it helpful. Straight Talk will provide detailed instructions on the activation process. I ordered a Micro Sim Card from Straight Talk. You can also order it from Amazon. You’ll need an “AT&T compatible SIM”. If you have an iPhone 6 plus, 6, 5, 5s or 5c, you’ll need a Nano SIM Card. If you have an iPhone 4 or 4S, you’ll need a Micro Sim Card. iPhone 3G and 3GS users will need the Standard Size SIM (used for older phones). You can buy the “AT&T Compatible Micro SIM + Unlimited Plan” or just the Micro SIM by itself. You’ll have a chance to pay for the plan with a credit card when you do the activation if you only buy the SIM. I purchased mine directly from Straight Talk as there was no other option back then. Shipping was free and the SIM was delivered in 3 days. NOTE: AT&T will NOT pro rate your final bill, so make sure you switch before your new billing cycle starts. (OPTIONAL) I waited until my AT&T contract ended and requested my iPhone to be unlocked at att.com/deviceunlock/. If you switch companies before your contract ends, AT&T will charge you Early Termination Fees. To request an unlock from AT&T, your phone needs to be out of contract or you should’ve paid early termination fees. You DON’T need to unlock your AT&T iPhone for it to work on Straight Talk, but as of now, you need to unlock it to have picture messaging working (MMS). A few minutes after requesting the unlock, I received an email saying: “We have received your request to unlock your AT&T Mobile device” and later, another email later saying “We have reviewed your request and confirmed that the device may be unlocked. Please allow 24 hours upon receipt of this notification to complete the unlock process“. Check here to read Eligibility Requirements for Unlocking All AT&T Mobile Devices. You will need to restore your phone via iTunes to complete the unlock (make sure to backup your data first). I followed the instructions on the Straight Talk Activation kit. You’ll be activating your SIM either by phone or online. I did my activation online at www.straighttalk.com/activate. Choose the activation option that fits your needs. If you want to keep the same number you had with AT&T, make sure to select “Activate my Straight Talk Service with a number from another company” (have your AT&T account number ready). After completing the activation request, wait for your current AT&T service to stop (“No Service” status). When your service has been disabled, you can then insert your new Straight Talk SIM. Surprisingly, for me this only took about 10 minutes, though the instructions say activation can take up to 48 hours. Once you have your new SIM installed, your status bar should now display “HOME” instead of “AT&T”. Test your phone by making a phone call. If this works, you are now on Straight Talk. NOTE: If you want to port your number, DO NOT call to cancel your AT&T service before activating your Straight Talk SIM. Once the porting process is completed AT&T will automatically cancel your account and send a Final Bill. (NO LONGER NEEDED. SKIP THIS STEP!) I updated my data settings. You need to do this in order to get your data (internet) working. While on Wi-Fi, open Safari and type in iapnupdatetfdata.straighttalk.com. Tap “Install” then tap “Install Now. Enter your pass code if prompted, and tap “Done. At this point exit your browser, turn the Wi-Fi off, and re-boot your phone. With the Wi-Fi off, access Safari to ensure your data connection is working. Troubleshooting: If online activation didn’t work or if you encountered any issues, call Straight Talk at 1-800-299-7784 for assistance (you can also post your question below and I’ll try my best to answer it). This process is a little more involved but it’s doable. It requires you to buy a T-Mobile SIM card to enter the correct data settings for your Straight Talk service. APN settings are “hidden” in AT&T iPhones (’cause they want to keep you as a customer forever), so you need to briefly insert a T-Mobile SIM card in order to access and update the APN settings (not hidden for T-Mobile customers). Here’s a basic guideline of what you’ll need to do. Check the provided links for step by step image/video instructions. 1. For iPhone 4S, order a T-mobile Micro SIM like this one from eBay or purchase one at Target (for iPhone 5, 5s, and 5c purchase a Nano SIM). 2. Remove your Straight Talk SIM and Insert your T-Mobile SIM. 4. Go to Home and open Notes. 5. Insert your Straight Talk SIM again. Wait for phone to change from “NO SIM” -> “Searching” -> “HOME”. 6. Double Tap and go back to the Cellular Data Network page. Leave fields not listed here blank. You might have to re-enter some of the settings again as you’ll see they’ll go back to their default values when you scroll down. 8. Go back to Cellular -> Settings. Reboot your phone (Turn OFF then ON). 9. Try sending an image text. If it works, you’re done! Any issues with switching an ATT 5S to Straight Talk since iOS 9/9.1 came out? Okay I have the IPhone A1241 8gb that is 3g At&t. Just got it gave to me & I got told they buy the at&t prepaid card & put on it. My ? Is how can I figure out if I can put an At&t prepaid card on it for sure? But I’m wanting to switch it to straight talk. How do I go about this?? Hi Shasta. 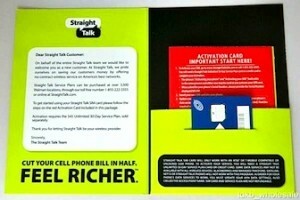 If you have an AT&T iPhone 3G and want to switch to Straight Talk, you’ll need a Standard SIM card from Straight Talk. See instructions here: Switch AT&T iPhone to Straight Talk in 4 Simple Steps. If you want the AT&T Prepaid Plan and you already have an active AT&T SIM, you just need to call AT&T so they can switch you to a “GoPhone” account. If you don’t have a SIM you’ll need to purchase a “GoPhone” SIM card. You can get it at an AT&T store or order it online. i recently purchased an att lumia 635 go phone which advertised unlimited data and a $2.00 per day flat rate. after paying full retail i purchased a $25.00 refill card realizing that the packaged product had no airtime included. upon giving the necessary info on the card to the 611 bot i discovered the rate was $2.00 per day text/call + $1.00 per 100 mb. i contacted att to request unlock code the response was that i would have to pay for 180 days before i was elegible for unlock. i again contacted att unlock request and selected the i paid full retail for device. the response was that i couldn’t unlock it because it was registered in another account as well. (note: 180 x $2.00 + 180 x $1.00 = way too much money for the service . please help i can’t stand the thought of att making all that money and never having a human answer for their action’s. Call the after hours customer support. Then select technical support, during mon-fri 9am-5pm. A person will answer. Return the phone! U have 15 days!!!!! Church! Worked for me the first time around. Tmobile SIM is key dude. Nice write up. You will have to take a new phone number, and pay for the data talk and text first, and give straight talk your phones imei number. Att is very smart though and it may not work possibly! Ask more people on yahoo answers first. I have an iphone 5 and I’m on straight talk. I bought the phone off eBay and I believe it was on T-mobile before that. My service works fine except instead of saying “TFW” it says “AT&T” and also my data doesn’t work and I can’t get MMS. Can anyone help me?? I’ve tried everything. It’s been like this ever since I got it. It was an Att phone before, and the seller was still under contract, and didn’t pay the early termination fee! So you must pay Att that first, so it will work on another carrier! Even though u can use straight talk on a locked Att iPhone, it needs to be in service still, and not suspended from non payment. See if eBay will help you get a refund from this seller… He screwed you. Radio shack, Att, and most carriers have a media transference device so your pics can be put on your phone from hers! Or you can have her download all your media to her PC and them put it on a thumb drive to put on your PC, then wirelessly transfer files from your PC to your phone! Your friend will then need to delete the media of yours off her PC, and reset the phone to factory settings! Don’t forget to back up your old phone to your iCloud before you sell or give it to a friend. This way is best cuz you will only need to connect your new phone back to your cloud/iTunes account, hence keeping all your media. Hi, are you still using the straight talk service? have you had any issues with dropped calls, data disruptions and/or missing text messages? I currently live in NYC and am tired of the $100/month cell phone bill and am very interested in bringing my iphone to straight talk, but haven’t found too many reviews with actual usage experience (just complaints about customer service). Thanks! Ok here’s my situation, I have iphone5 jus bought i6 plus had both my phones unlocked. my request was granted by AT&T went through all the steps and both phones are unlocked. i will be selling the 5 on Craigslist and using the 6, still with AT&T. anywhoo my problem is my SIM card is reading no service on both old and new devices, but when I stick my friends AT&T SIM in both device it works. So I’m wondering when they say please wait 24hours before porting your number, if that is what they are talking about? any info would be helpful I’m hoping it’s just that and tomorrow it will work. When you change devices with Att, the current SIM card is deactivated, unless you are upgrading iPhones through them! If u buy an iPhone 6 online, you just need to buy a new Att SIM card ($25 or free if you stay with Att) and call Att, to link the new phones IMEI # with your new SIM card’s number! It is working from your friends SIM card cuz they haven’t stopped service on the phone number, account, and their linked IMEI # & SIM CARD #. I suspended service because my phone froze within the first year, and luckily APPLE will swap out a new iPhone to you if is still under the 1 year warranty! I backed up my iPhone 5S via the cloud inside the apple store, reset it to factory settings, and the genius team member handede a new phone. When I put my old iPhone SIM card inside, it said ” no service”. So after calling Att and apple for 5 hours, I finally reached a tech person from radio shack! They explained what I explained above…. Once a phone SIM NUMBER is stopped, suspended, or the phone number related to your old phone is transferred to a new device, it’s ” burned”, so they can sell em to customers like you for $25!!! Att screwed me over by suggesting I buy a go phone, a cheap one, until I got my replacement iPhone, so I had a phone for calls if Apple gave me any trouble, or I had to allow them to fix my old iPhone by sending it out for refurbishment. So they had to switch my phone number to an ANDROID phone, which takes micro sim, not nano sim used in iPhones only. Therefore my phones old SIM card was wiped/inactive when it no longer was linked to my number/IMEI/old iPhone! I bought a nano/mini SIM from radio shack for $25, and had Att link new iPhone’s IMEI # to the new SIM card #, and it worked great! So my advice would be to go directly to apple first, take your old SIM card out before swapping out for the working iPhone, and just pop it in the new phone! DO NOT REPORT IT TO ATT, or they will input the new phones IMEI # into your accounts contract, therefore locking it to their network!! Had I known all this lock/unlocked stuff, I could have brought my new phone directly to straight talk, and skipped out on the contract early term fee and last payment!!! But since my 2nd iPhone 5s is acting up, I just might ask apple if I can swap it out one more time… Hope this helps someone save $ , time, hassle… Etc. I did return the Att go phone/pay as you go Android phone though, and got a full refund, because I didn’t buy a card data plan, I just had Att put my regular plan on this temporary phone, so I was getting the service I pay for on my monthly bill. Skip that step, as Apple was so fast and helpful!! I recently dowloaded the apn from straight talk and everything seems to be working fine but my youtube app won’t load anything on 3G only wifi…. what’s going on huuur? At step 4 my iphone restarts itself and never gets the config files. what do i do? I did all of that and still nothing. Nothing’s wrong with the phone. Its unlocked and has been verified that it can work on straight talk. I activated my SIM and stuck it in and it just says “no service” I’ve called customer service and they make me do the same thingb every time until theyve run outta things to do and then they give me lame excuse about an outage and tell me to wait 24hrs. I’ve been at this for 3 weeks. Someone please help me. I’ve factory reset it updated it unlocked it reset network settings etc. Please help. Hello , i am buying an iPhone 4s from my friend. It was hers and she bought a new iphone. She was under AT&T contract & shes only had that phone for 10 months before purchasing the new one. Is there anyway possible that i can still unlock the phone & turn it into a straight talk phone ? Please help ? Can I Unlock my iPhone if it under AT&T contract? Or I need wait when it will end? To request an unlock from AT&T, your phone needs to be out of contract or you should’ve paid early termination fees. That being said, you DON’T need to unlock your AT&T iPhone for it to work on Straight Talk. I know you just told me exactly what to do, but I am buyng an iPhone 4 from my Uncle, and it was recently on a contract. But, they let the bill go and now it is cut off, I wanna know if the phone is still on the contract or not, its a question that even my uncle doesn’t know. I aint to sure of exactly how much everything will cost to get it set up and I was wanting to know an estimate. Thank you very much in advance. You need to call AT&T customer service and request technical support. Your uncle will need to prove he still has the phone by giving his social security number, and then AT&T will tell you the balance owed / early termination fees…. I did this cuz I just couldn’t keep up with the cost of their data, so they cut me off until I paid. If you pay his final fees to get the unlock, you won’t have trouble with AT&T doing an unlock. Beware; the fees are steep! I was over due over $500, and early termination costs $150 if you paid for at least a year straight. Good luck…. I realized I’d be better of buying an unlocked iPhone from eBay for $250, instead of $650! Yes it’s bad for my credit, but I’m on a fixed income and it’s not possible!!! So, if I were you I’d return the phone to mr cheap uncle who is pawning off his bill on you, if you want the phone unlocked legally. My service is AT&T GO Phone service, should I take the same steps above? I have been on the Activation Finalization screen for about 30 minutes now, Can I close this or do I need to wait? Any idea? I’ve done the steps to get my internet. What’s the pass code? I can’t get past this point? Everybody says it may ask for pass code but nobody tells u where to get pass code!!!! I am attempting to change my apn settings. Where do I get the pass code? Is this my loggin password for straight talk? Hi Dave. The passcode mentioned refers to your iPhone’s passcode lock. If you don’t have one, then you should be able to install the apn profile without entering a passcode. Having said that, things have changed for the better since I published these instructions two weeks ago. The latest iOS 7.0.3 update includes a Straight Talk carrier update (TFW 15.6). This should push the correct apn settings to your phone without the need of doing anything else, except for activating your SIM card (given that you have the latest straight talk SIM card installed, which I suppose you do). Straight Talk is just another Tracfone brand name. The latter offers services under various names including Straight Talk, NET10 Wireless and Simple Mobile. Straight Talk is a brand working through a partnership between TracFone and Walmart. I believe they currently offer the cheapest iPhone plans on the market. I just switched from AT&T and so far I can’t tell any difference in coverage or service and I’m literally paying half of what I was paying. I have only recently started hearing about Straight Talk from some of my customers that ask me if I buy or sell used Straight Talk phones. I checked out their website but could not find much information on service areas or coverage. I assume this is a company much like Cricket that has a pre-paid service and low rates but I can only assume that this also comes with less coverage and perhaps even less service. i see the industry leaning towards contract free service and unlimited talk and data* with restrictions on some plans of course. It looks as if they have been around for some years now but I’ve not seen much in the way of marketing in the media from them. Is this company a division of a larger telecommunications company?